The rock in the Habantota International Harbour (HIH) that prevented the berthing of large ships had been blasted at a cost of US$35 to US$40 million and the pieces are being removed, a senior Hambantota harbour official said today. Chief Engineer Ajil Hewageegana said the removal of the pieces of the blasted rock and clearing operation would be concluded in three weeks enabling large ships, container carriers and mammoth oil tankers to enter the Hambantota Harbour. 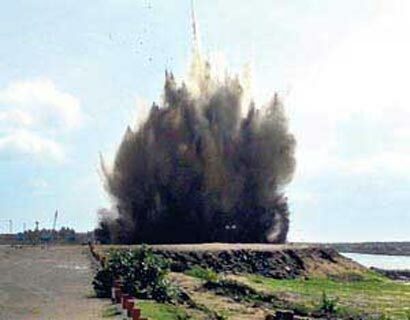 “The blasting was carried out by the China Harbour Engineering Company. The rock did not affect the activities of the harbour but there has been some disturbance to the central canal,” he said. We could have saved the country this extra expenditure of $40 million had we blasted the rock before the water was let into the harbour. Someone should answer to the country for this cras mistake. He should be named and shamed and lose his job. Nicholas, some poor and innocent public servant will perhaps pay a price for this mishap. I wonder why this obstruction was not identified in the feasibility study for this white elephant? pation of the naval activities be started soon. JS, it is not a white elephant. The harbour is a great asset as it is situated in the hub of commercial sea lanes. We are fortunate to have this harbour. Let us hope the cost of building the harbour will be re-couperated and valuable foreign exchange earned for the nation.